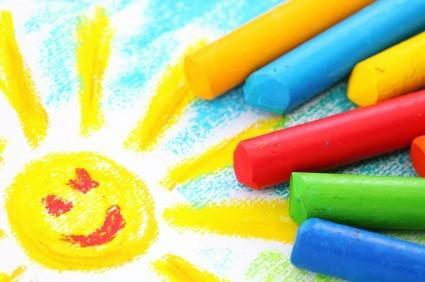 Whether you teach in a day care, a school program, or Sunday school preschool, spring crafts are a great way to give your students a creative outlet and celebrating the changing seasons. Spring brings with it many opportunities for crafting, from Easter items to the celebration of the end of winter. Baby animals, butterflies, flowers, and rainbows are just some of the symbols that are associated with spring. Crafts should be age-appropriate so that each child is able to succeed and finish the craft. Depending on the age group you are working with, you will want to have older children or adult helpers. Keep the craft time short at this age. Five or six minutes for a two-year-old and no more than ten or 15 for a five-year-old is just about right. Make sure that the materials you use are non-toxic. Having an old shirt of dad's or mom's on hand to use as art smocks will help the children stay clean. Simple spring crafts take little time and usually not much money. You can keep a variety of supplies and ideas on hand to fill in unexpected free time with a fun craft. Get small Easter baskets, and line them with plastic. Fill them with potting soil, and allow the children to sprinkle grass seed over the soil. Keep the soil moist, and in a few days, grass with begin to grow. These can be used as Easter baskets or decorative centerpieces. Cut out a tree trunk from brown construction paper, and have the children glue it to a piece of blue construction paper. Use bits of pink and white tissue paper, and glue them to the tree, creating cherry blossoms. This is great for a unit study on Japan. Perfect for Easter time, children can create cute bonnets from paper plates. Punch a hole in each side of a paper plate, directly across from each other, and run a ribbon through them. When the hat is finished this ribbon will be tied under the child's chin. Provide each child with cotton balls, yarn, crepe paper, ribbon, feathers, and an assortment of other embellishments to glue on to the plates to create hats. You will need two squares of cheesecloth, or white cotton for each child. Have them pick wildflowers in a variety of colors and place them between the cheesecloth squares. Have them pound the fabric with a rubber mallet. When the top layer of fabric is peeled away and the flowers are removed, there will be splotches of color from the flowers. Have each child color the coffee filter with a variety of colors of markers. Using the brush, paint water over the coffee filter allowing the colors to combine. Set the filter aside to dry. Meanwhile, paint the clothespin and let it dry. Glue eyes to the clothes pin. Glue pipe cleaners on as antennae. Scrunch the coffee filter together in the middle and clip with the clothespin to create a butterfly. You can find many resources for spring crafts at your local library. Numerous books of crafts for children will be available there, as well as magazines that may have crafts in them. If you have a collection of arts and crafts supplies you can have craft time at a moment's notice. Having a craft cabinet or bin will keep everything in one place and ready to go when your children are ready to create.